1955 Penn Yan Commander Aristocrat Preservation Complete! We could not be more pleased with the preservation results as this truly darling 1955 Penn Yan Commander Aristocrat, hull number is ORH 552832, who rides on her brand new, 2016 Load-Rite aluminum trailer, debuts post-preservation and is now available to the person or family who falls in love with her. She is quite original, even to the point of retaining the original covering plate for the steering column hole in the dash not being used as the helm station. Her Taylor Made windshield is original as is her hardware, all of which is still with the boat. She is powered by a 1954, Model RDE-16 25 horse Johnson Sea Horse engine. 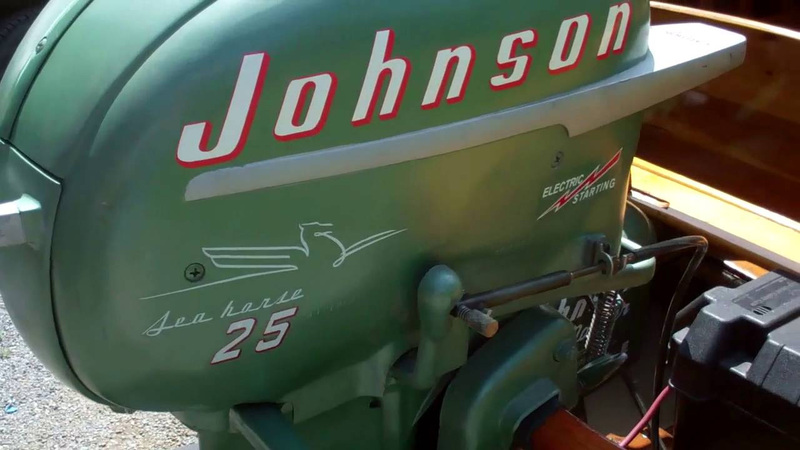 The engine, solenoid box and engine controls retain their original Johnson Sea Horse Green paint, all of which is in exquisite condition. Removing the cowl reveals an equally clean, bright engine that also retains its original Sea Horse green paint. Her ignition plate matches the rest of the ensemble in terms of its originality, color and condition. We serviced her completely, part of which process involved installing a rebuilt starting motor and new electric choke along with the standard plugs, points, etc. As you will see in her post-preservation debut video, the engine starts, idles and revs up easily, smoothly and strongly. The boat is interesting in that the center-steer station can be installed in either compartment. We plan to re-position the original Wilcox Crittenden steering wheel and engine controls to the forward compartment. The Striptite hull and transom, both inside and out, was in superb structural condition when she arrived last fall, but now has been preserved to an eye-popping show-ready condition throughout. We retained the original and unbelievably rich color and varnish on the decks, and similarly for cedar and oak interior, as well as the oak gunwales by sanding all surfaces flat by hand and with great care. The decks, gunwales and rub rails then received six top coats of Pettit Hi-Build varnish that was carefully sanded with progressively finer grades of paper, until the last pass with 500 grit following the fifth and in preparation for the sixth and final coat. I hope you will agree that, as presented in the photos and video that accompany this offering, she is a stunner who has not been spoiled by over-restoration throughout. Perhaps the most tedious portion of the preservation process was first scrubbing her interior clean, followed by sanding with 180 and then 220 grit. Three coats of Sikkens Cetol Marine completed the interior preservation. The finish on the transom, seating components and rub and spray rails just could not be saved. We had to strip to bare wood, sand, stain and seal with three coats of Clear Penetrating Epoxy Sealer. The seating then received three coats of Sikkens Cetol Marine. Twelve coats of Pettit Hi-Build varnish were rolled and tipped onto the transom and rub and spray rails. We stripped the exterior hull to bare wood from gunwales to keel and sealed it with three coats of Clear Penetrating Epoxy Sealer, followed by five coats of Interlux 2000E Two-Part Epoxy Barrier Coat which makes water infiltration impossible. We finished the project by applying six coasts of Epifanes Monourethane above and below the waterline. Her 2016 Load-Rite trailer is brand new and comes with both a title and Bill of Sale. We will also provide a Bill of Sale for the Commander Aristocrat. Here is an example of the best of Penn Yan who will be a strong contender to win Best of Class, if not Best of Show in any show she is in.